Putting 'Deadliest Mass Shooting In U.S. History' Into Some Historical Context : The Two-Way The United States has had many devastating mass killings. But modern mass shootings have emerged as a category all their own. 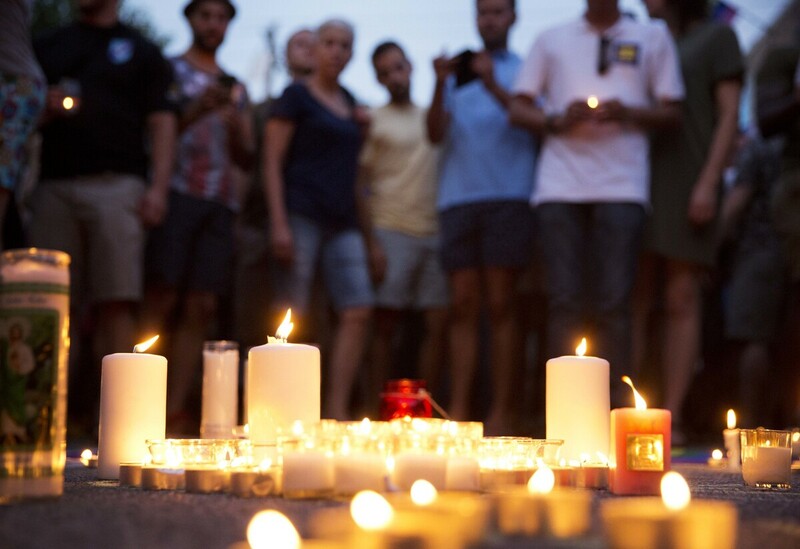 Mourners gather around candles lit during a vigil after the deadly shooting at the Pulse Orlando nightclub on Sunday. When we tried to put the killing of 49 people at an Orlando nightclub on Sunday morning in context, we said and wrote that it was the "deadliest mass shooting in U.S. history." It was a deadlier attack than the shooting at Virginia Tech, which left 33 people dead, including the shooter. Almost immediately, our readers and listeners said we were whitewashing history. What about the Wounded Knee Massacre? Or Mountain Meadows Massacre in 1857? Or the Tulsa Massacre in 1921, a reader on Twitter asked. The Wounded Knee Massacre was devastating — about 250 Native Americans were killed by American troops in the late 1800s. Only one man faced prosecution for the Mountain Meadows Massacre, but it was actually a Mormon militia that killed 120 men, women and children. The Tulsa Massacre ended with about 300 people killed by mobs of white people. This is something we discussed in the newsroom. It felt like the shootings — in Orlando, in Sandy Hook, at the Luby's Cafeteria in Killeen, Texas — were different enough that we could say "deadliest mass shooting in the U.S." and still be respectful of all that previous history. I called Grant Duwe, the director of research and evaluation at the Minnesota Department of Corrections, for a second opinion. Duwe wrote one of the most exhaustive histories of mass murder in the United States. He said the phrase we use is serviceable. He says he sees two distinctions between mass murders that occurred before and after the 20th century. Before 1900, most mass murders were perpetrated by the "haves" against the "have nots." After 1900, mass murders began being perpetrated by the "have nots" against the "haves." Another difference is that before the 20th century, few mass murders were perpetrated by a single person. A gunman opening fire on a public space is what "mass shooting" has come to mean these days, Duwe said. We don't tend to put massacres involving military or quasi-military actors and those perpetrated by a group in that category. By that definition — a shooting that takes place in a public space and does not involve another crime like robbery — what happened in Orlando is the deadliest of the 178 public mass shootings Duwe has counted since the early 1900s. Duwe does caution that we should always add a time element to our characterization. When he wrote his book, he thought he had uncovered all mass murders. After it was published, however, he was contacted by a man who kept his own list. He realized that some cases on that list fit his own definition and he had missed them. "Our understanding of this topic, even though it is better than it was 10, 15, 20 years ago, is still imperfect," Duwe warned. Therefore, in service of precision, history and what we may not know, what happened in Orlando on Sunday was the deadliest mass public shooting in modern U.S. history.